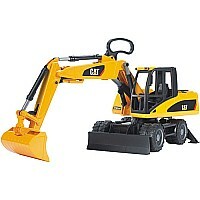 This Caterpillar Excavator is wheeled for use on concrete or asphalt! Realistic details include sculpted rubber wheels, an easy-to-use shovel arm with removable bucket that is operated with a handle, a cab that rotates 360° and a hood that opens to reveal the ventilator grill. Dimensions: 17.3"l x 6.7"W x 10.5"H Case Pack Qty: 4 pcs.